Asked to name important inventors and you might start with Thomas Edison, Alexander Graham Bell or Leonardo da Vinci. But what about Mary Anderson? Or Ann Tsukamoto? You might not know their names, but they are just two of the female inventors behind everyday objects and scientific innovations. BBC 100 Women, the season featuring stories of inspiring and influential women, is taking on a new challenge. This year, women from around the world will be asked to come up with innovations to tackle some of the biggest problems they face. Scroll down for more information about 100 Women - and, for more inspiration, here are nine inventions we wouldn't have, if it weren't for ground-breaking women. After joining the US Navy during the Second World War, Rear Admiral Grace Hopper was assigned to work on a new computer, called the Mark 1. It wasn't long before she was at the forefront of computer programming in the 1950s. 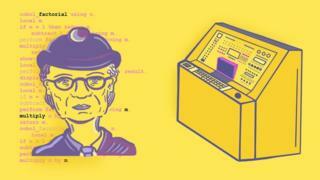 She was behind the compiler, which could translate instructions into code that computers can read, making programming quicker and ultimately revolutionising how computers worked. Hopper also helped popularised the term "de-bugging" that we still use on computers programmes today, after a moth was removed from inside her machine. "Amazing Grace", as she was known, continued working with computers until she retired from the navy as its oldest serving officer, aged 79. Dr Shirley Ann Jackson is an American theoretical physicist, whose research from the 1970s is responsible for caller ID and call waiting. Her breakthroughs in telecommunications have also enabled others to invent the portable fax, fibre optic cables and solar cells. She is the first African-American woman to gain a PhD from the Massachusetts Institute of Technology and the first African-American woman to lead a top-ranked research university. On a winter's day of 1903, Mary Anderson was visiting New York City when she noticed that her driver was forced to open his window, just to the clear the snow from his windscreen. Every time the window was open, the passengers in the car got colder. Anderson started drawing her solution of a rubber blade that could be moved from inside the car, and in 1903 was awarded a patent for her device. But the invention proved unsuccessful with car companies, who believed it would distract drivers. Anderson never profited from her invention, even when the wipers later became standard on cars. It might not have the catchiest name on this list, but the long cycle-life nickel-hydrogen battery has helped power the International Space Station, so it's pretty important. Olga D Gonzalez-Sanabria, who is originally from Puerto Rico, developed technology which helped create these batteries in the 1980s and is now director of engineering at Nasa's Glenn Research Centre. A frequent entertainer, Cochrane wanted a machine that would wash her dishes faster than her servants, and be less likely to break them. Her machine, which involved a motor turning a wheel inside a copper boiler, was the first automatic dishwasher to use water pressure. Cochrane's alcoholic husband had left her with masses of debt after his death and this motivated her to patent her invention in 1886 and open her own production factory. A nurse, who was often home alone, Marie Van Brittan Brown came up with an idea that would make her feel safer. Together with her husband Albert, Van Brittan Brown developed the first home security system in response to the rising crime rates and slow police responses of the 1960s. The device was complicated, with a camera powered by a motor which moved up and down the door to look through a peephole. A monitor in her bedroom also came equipped with an alarm button. Her patent was awarded in 1991 and since then Tsukamoto's work has led to great advancements in understanding the blood systems of cancer patients, which could lead to a cure for the disease. Tsukamoto is currently conducting further research into stem cell growth and is the co-patentee on more than seven other inventions. This chemist invented the lightweight fibre used in bullet-proof vests and body armour. Since her discovery in 1965, the material, which is five times stronger than steel, has saved lives and is used by millions every day. It's found in products ranging from household gloves and mobiles phones to aeroplanes and suspension bridges. A man named Charles Darrow is often credited with creating the most popular board game in history, but the rules were in fact invented by Elizabeth Magie. Magie wanted to demonstrate the problems with capitalism with an innovative game in which players traded fake money and property. Her design, which she patented in 1904, was called The Landlord's Game. The game of Monopoly that we know today was published in 1935 by the Parker Brothers, who discovered that Darrow was not the sole creator and had, for just $500 (£385), bought Magie's patent and, well, monopolised the game. There are many more female inventors out there, so let us know your favourites by getting in touch on Facebook, Instagram and Twitter, using #100Women. In 2017, we're challenging 100 Women to tackle four of the biggest problems facing women today - the glass ceiling, female illiteracy, harassment in public spaces and sexism in sport. They need your help - send us your ideas using this form.